FileMaker Hosting - What Plan is Right for You? - Productive Computing, Inc. When it comes to hosting your FileMaker solution, there are a lot of options out there. You can host it yourself onsite, you can host with a service, or you can explore FileMaker Cloud. Let's assume that you've decided the hassle and costs associated with hosting your solution yourself are too prohibitive and you've decided to host with a service. Now you're looking at plans. There is shared hosting and dedicated hosting and concierge services for FileMaker Cloud (not discussed in this blog, but follow this link for more info). 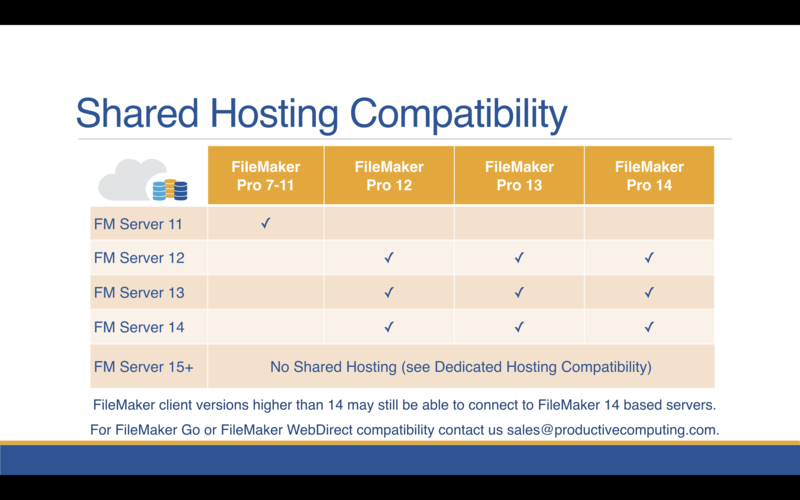 If don't want to or don’t need to upgrade to FileMaker Server 15 or above, a shared hosting plan could be perfect for your needs. We offer four plans (Micro Team, Small Team, Medium Team, and Large Team - henceforth referred to as Micro, Small, Medium, and Large) designed to cover, accommodate, and service a wide variety of needs and requirements. Let's review some of the factors that go into deciding which plan is the best fit for you. If your files' total sizes are less than 5 GB, you are probably okay going with the Micro plan. With 60 GB of disk space available, anything larger than 5 GB becomes too big for the standard backup routines that are included with the plan. If you have files over 10 GB, then you may want to consider a Medium or Large plan. These servers can hold files up to 150 GB - giving you lots of room for your FileMaker file and even external data too. All of these use a lot of bandwidth, so we'd suggest our Medium or Large plan. If you use your solution more for regular data entry and as storage for historical documents that you are not downloading daily – you'll be fine with a Small plan (or maybe even a Micro). If you're interested in hosting your solution with us, give us a call today (760-510-1200) and talk to one of our hosting engineers. We'll discuss your requirements and specifications and get you on track with exactly what you need.